Canada is pushing for a NAFTA review. 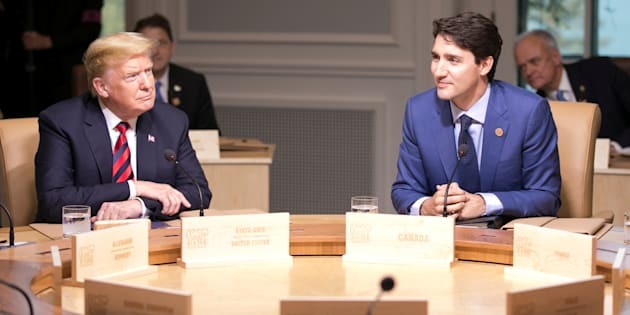 Prime Minister Justin Trudeau and U.S. President Donald Trump participate in the working session at the G7 Summit in the Charlevoix town of La Malbaie, Quebec on June 8, 2018. OTTAWA — The Trudeau government has asked for a NAFTA review of a Trump administration tariff on solar panel cells, saying the 30-per-cent charge is illegal and unfair. The Liberal government considers the latest trade challenge a part of its broader defence of the international-rules based trading order — something U.S. President Donald Trump is regularly accused of undermining with his "America First" protectionist policies. The request Monday for a review under NAFTA's chapter 20 provision comes one day after Mexico's president- elect publicized a letter to Trump, calling for a reboot of the talks towards a new three-way continental trade pact. Global Affairs Canada said the tariff has hurt workers in the clean energy sector on both sides of the border. "Canada is a strong supporter of rules-based international trade and looks to its trade partners to also uphold their international obligations," the department said in a statement. The move comes after three Canadian solar panel manufacturers filed a lawsuit against the U.S. government in February. The suit claimed that a 2017 investigation by the U.S. International Trade Commission concluded the Canadian products don't significantly harm American manufacturers. The tariff on solar cells was also challenged at the World Trade Organization by the European Union, China, South Korea and Taiwan. "Canada is using every available avenue, including the mechanisms within the NAFTA, to challenge the Trump administration's protectionism and defend Canadian interests," said Roland Paris, a University of Ottawa international relations expert and Prime Minister Justin Trudeau's former foreign affairs adviser. The NAFTA challenge comes as the three countries take a pause from renegotiating the pact, and as Mexico and Canada fight back against punishing U.S. tariffs on imports of steel and aluminum. The spat over metals has diminished relations between Canada and the U.S., with Trump hurling personal insults at Trudeau on Twitter, and raising questions about whether the NAFTA talks can proceed. Last week, Trump mused about separate deals with Canada and Mexico. The NAFTA renegotiation has been on hold since late spring because of the July 1 Mexican presidential election that will see Andres Manuel Lopez Obrador sworn in this coming December. Obrador sent Trump a letter that urges a restart of the NAFTA renegotiations. "I think that prolonging the uncertainty could slow down investments in the medium- and long-term, which obviously hinders economic growth in Mexico," wrote Obrador. He said his transition team members would take part in the talks with current government members. The office of Foreign Affairs Minister Chrystia Freeland had no immediate comment on the letter. Freeland, Finance Minister Bill Morneau and International Trade Minister Jim Carr travel to Mexico City this week to meet the incoming Mexican leader. Paris said Obrador's message is a welcome development, "but it won't reduce Canadians' apprehensions about President Trump and his administration." Paris cited the results of research conducted by Earnscliffe Strategy Group for the Department of National Defence. One question asked respondents for their biggest national security concern. The top answer was terrorism at 29 per cent. But Paris said he found it "striking" that the runaway second-place result — at 16 per cent — was the "United States (and) Canada's proximity to the U.S."
He said the answer has less to do with traditional perceptions of threats to national security, and "reveals a more general concern about the impact of the Trump administration on Canadian interests, including our economic interests." The research was conducted between February and April and included eight focus groups and a telephone poll of more than 1,500 respondents. It had a margin of error of 2.5 per cent.